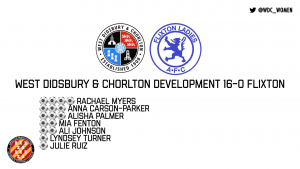 West Didsbury & Chorlton Women made it consecutive league wins this season as they edged past Curzon Ashton at home on Sunday. Suffering from notable absentees including Chloe Spencer and El Powles from last week’s squad there were two changes to the starting line-up as West were able to welcome back Amy Vyas and Katy Wilman into the starting eleven. Vicky Kerr was also a welcome return to the bench with West still without the long term absences of Vicky Frisby and Shauna Edmondson. The game started slowly with the home side unable to gain the upper hand in the early stages until Elizabeth Livesey connected with an Ellie Caddick corner forcing Curzon Ashton goalkeeper Alex Moon into an excellent save pushing the hard effort over the bar. On 17 minutes West thought they’d taken the lead as Rachael Dunlop fired a rocket off the underside of the crossbar with Livesey on hand to tap in the rebound but the referee had adjudged the West striker to be offside. West took the lead in similar fashion on 31 minutes as Dunlop cannoned a shot off the crossbar for a second time but this time Sophie Bracegirdle remained on side and drilled home the rebound. Incredibly Dunlop would strike the woodwork for a third time in the half moments later as West sought to increase their lead. The lead was eventually doubled on 36 minutes as quick thinking from the impressive Amy Friel restarted play down the left from a throw in, Jami Hodges who combined with Vyas and Livesey with the latter’s low ball across the penalty finding Bracegirdle at the far post. The West winger coolly took her time before firing into the bottom corner to give West a 2-0 lead. Despite their own depleted numbers Curzon dug in and halved the deficit two minutes later as a nicely worked move down the left saw the ball pulled back to Mya Holmes on the penalty spot and she finished emphatically to make it 2-1. West suffered a further set back just before half time as Vyas, having dictated much of the play in the final third, was forced to withdraw with a hamstring injury. 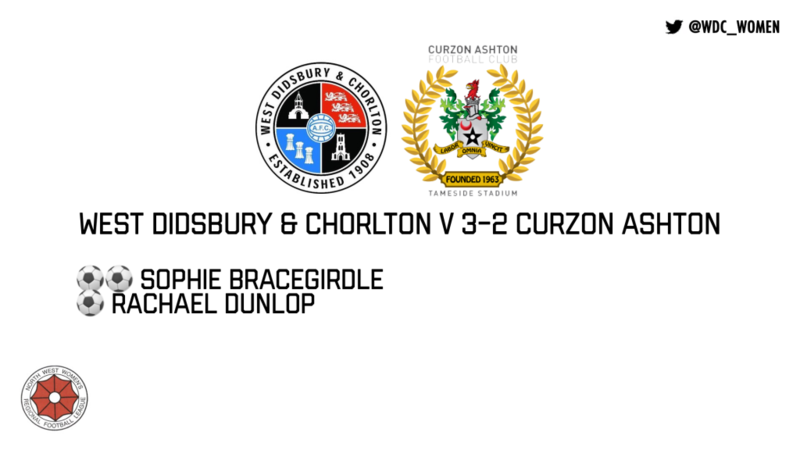 The second half saw West start uncharacteristically slowly and Curzon took full advantage on 51 minutes as they broke the offside trap allowing Stephanie Upsell through who spotting Claire Jefferson off her line restored parity between the two sides. West tried to wrestle the game back in their favour as twice Bracegirdle fired just wide of the post just before the hour mark after good combination play down the right hand side. Bracegirdle turned provider on 75 minutes and must have thought she had an assist to her name when her low cross found Dunlop and her effort cannoned off the underside of the cross bar for a fourth time before bouncing out. However Dunlop was not to be denied, taking the game into her own hands, as five minutes before half time she was brought down inside the penalty area. Coolly, the West stand-in captain stepped up and fired home for her 16th goal of the season to make her the record scorer in a single season for West Women as West were able to see the game out having survived a scare from a determined Curzon side. The win lifted West up to third, two points behind new leaders Warrington Wolverines but with three games in hand.